AWI’s AWOS 3000 automatically measures meteorological parameters, uses a powerful computer to analyze the data, and broadcasts aviation weather reports. These certified weather reports can be used to fulfill the requirements of various FARs, create published flight plans, or even report to the National Weather Service. 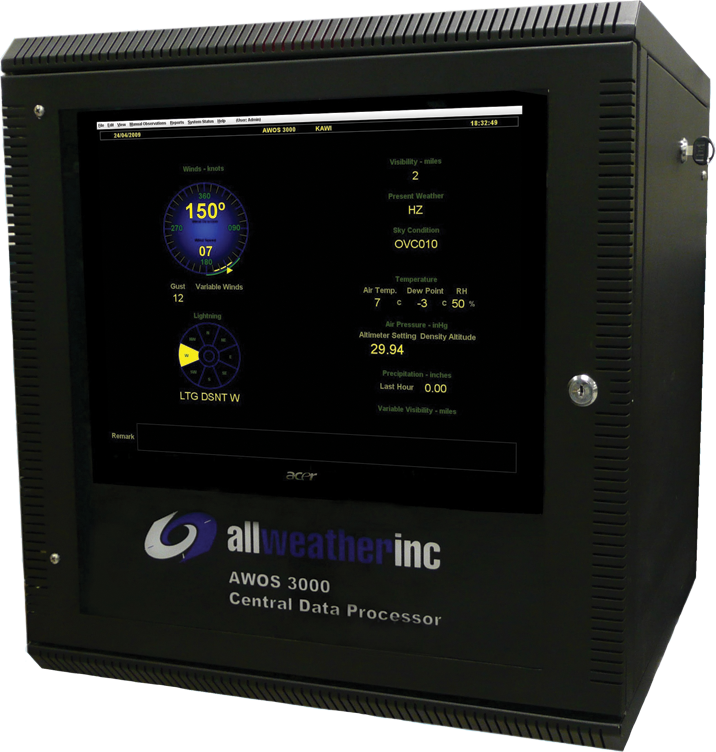 The AWOS 3000 is a modular system that uses a Central Data Processor (CDP) receiving input from multiple sensors. Use the tabs above to determine which certified configuration is right for you. Every AWOS 3000 is equipped with a CDP which processes the data, provides data storage, and includes a 15” color monitor for data display. The 3000 series software displays weather information with an automatic color change for error messages and off-line sensors. This easy-to-use software is menu-driven and includes help screens for each menu. All algorithms used in processing your weather data are FAA and ICAO approved to ensure accurate information is sent to your airport users. The AWOS 3000 can archive up to one year of data, taken at 5 minute intervals. An AWOS printer is also available to help with report generation, error message reporting, and printing of archived data. Each AWOS sensor is manufactured for the quality and accuracy you have come to expect from AWI. The sensors provided with your AWOS 3000 meet or exceed the requirements of the FAA as well as the international governing bodies, ICAO and WMO. This checklist will provide you with a step-by-step guide to add a FAA certified AWOS to your airport. For additional information, call us at 1-800-824-5873 or email us here. AWOS Net is a data display network that leverages the capability of All Weather Inc’s Automated Weather Observing System (AWOS) to broadcast current weather information to a flexible network of display stations. Using AWOS Net, current, accurate weather information is available to local and remote displays. The AWOS Net system consists of an AWOS Net controller and communication interface connected to an AWOS, along with one or more displays. The AWOS Net receives data only from the AWOS and cannot transmit data back to the AWOS. This closed system of one-way communication ensures that the data displayed by the AWOS Net will always be up to date and accurate. There are three types of communication link offered with the AWOS Net. At a minimum of once per minute, the AWOS broadcasts its latest weather data. The AWOS Net controller acquires this information from the AWOS CDP and broadcasts it to all active remote displays via an Ethernet connection. This system allows any AWOS Net display to receive up-to-date information within milliseconds of the broadcast. Remote users can also view the AWOS weather data in a standard web browser via the internet or local network connection. Product information sheets for AWOS Net and other peripheral items are available here.